Imagine how it would be to get all details about your phone in one place. Sounds good? Well there is a good news of all Sony users. Sony has added a new feature in its Xperia series named as "Diagnostics application". You might not have used this feature yet. Here's all what you need to know about it. What does diagnostics application do? 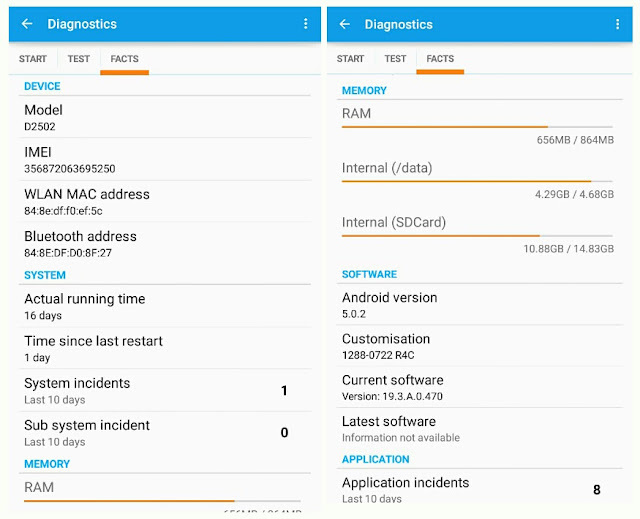 The diagnostics application provides useful information about your phone such as software version, product model, IMEI number and memory usage. This application collects and save information about your usage of the application. Good thing about this feature is that, it can also be used to test your phone features so as to find out whether they are working properly or not. 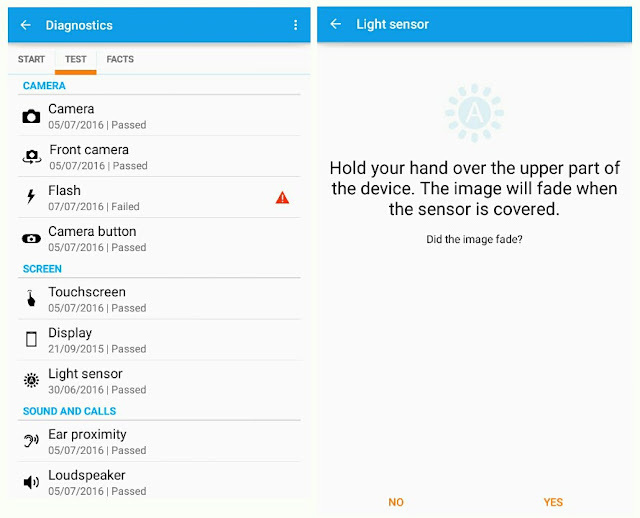 If you're facing any issue in your phone (say if camera or light sensor isn't working), you can run a simple diagnostics test to detect the source of problem. Now scroll down and click "About phone". Finally tap the "Diagnostics" option. This is the default tab where you'll find all basic information about your phone which includes your phone name, model number, IMEI number and storage capacity. If a new software update is available, it will show you a download option as shown in below picture. 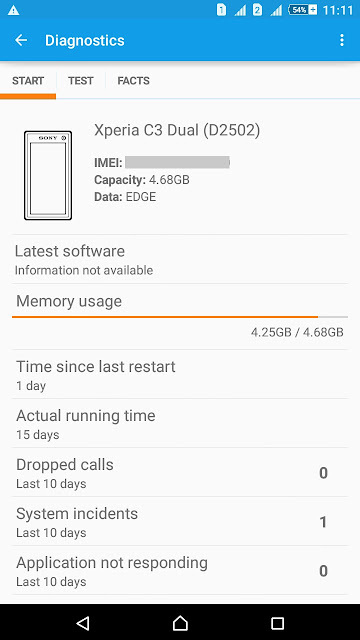 Apart from this, you'll find your phone's Internal memory usage and other useful details like time since last restart, running time and dropped calls. Here you can test your phone functions such as camera, screen, sound, call, wireless, connection and orientation. To run a specific diagnostic test, first select it from the list and then follow on-screen instructions. Simply tap Yes or No button to confirm if a feature works or not. After completing the test, you'll find the test status (whether it's passed or failed) and the time info (when it was tested last time), next to the each feature. You can also run all tests at the same time. To do this, scroll down the page to the bottom and click "Run all" option. As name itself suggests, facts tab will tell you every fact about your phone. This is similar to start tab but more advanced than it. Under device section, you'll find your model number, IMEI number, Wi-Fi MAC and Bluetooth address. 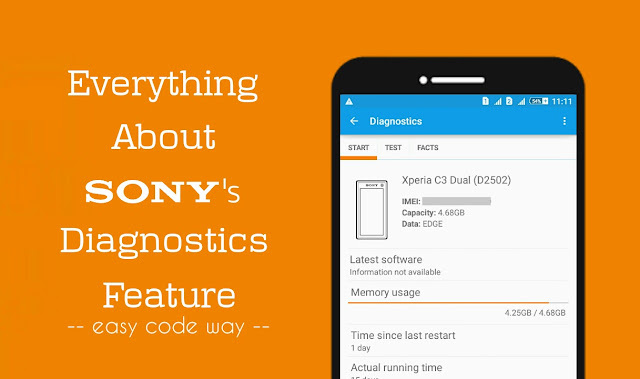 This is all what you need to know about new Sony's diagnostics application. If you've any doubts, feel free to ask me in below comment box. Stay tuned for more interesting tutorials. What do you think about this feature?